ProOnGo Expense from ProOnGo is a very handy app for anyone who needs to track their expenses from a mobile device. With several automated features, ProOnGo Expense does most of the work for you, so you can say goodbye to typing up those pesky expense reports by hand. Miles to Go Before I Sleep: ProOnGo Expense lets you save receipts with the iPhone 3GS's camera, track your time on projects, and log mileage. ProOnGo Expense lets you keep track of regular expenses as well as time and mileage. 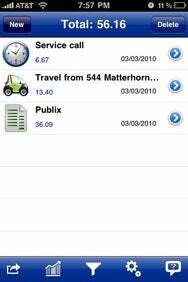 To record an expense, you can just use the iPhone 3GS’s camera to snap a picture of a receipt, and ProOnGO’s receipt reader will do all the dirty work, filling in the merchant name, date and dollar amount. The app comes loaded with 15 free receipt reads; after that, you’ll have to pay for the receipt reader service. Subscription plans range from $3 a month for 30 reads to $5 a month for 50 reads. The results of the reader service were very accurate in my tests. After you’ve taken a picture of your receipt, you are presented with some basic image editing tools so you can rotate, zoom, pan, and even hide any personal details before uploading it to ProOnGo’s servers. After a few minutes, the app will ask you if it got all the details correct and then fill in all the numbers for you automatically. Even if you don’t subscribe to the reader service, it only takes a few seconds to manually enter the information yourself. ProOnGo makes tracking mileage pretty easy as well. When you start your trip, the app will use your current location as the starting point. Once you’ve arrived, you just open the app and again use GPS to fill in the destination. The mileage is automatically calculated and entered as well as the dollar amount based on the per-mile rate you have entered. There is no way to have multiple destinations so you have to start a new log for the return trip. You can also enter information manually. When tracking a time expense, you can enter a title and an hourly rate and the current time is automatically set as the starting time. When you are finished, you just open ProOnGo Expense and select ending time—the current time is automatically entered, and the dollar amount is calculated. Of course, the times can be manually entered as well. ProOnGo Expense will create expense reports that you can e-mail as an Excel spreadsheets, XML file, or even as a fax to any North American fax number. (The most recent update to the app offered improvements to the interface for faxing receipt images.) If you use Quickbooks Online, you can even have the expense reports sync up to it. Any receipt pictures or notes associated with expenses are also attached to the spreadsheets. ProOnGo Expense will also convert all your expense data into pie charts and bar graphs. Pictures of the charts and graphs can easily be saved to your iPhone photo library by tapping the save button. ProOnGo Expense makes tracking your expenses super easy, especially when using the receipt reader service. This article was updated at 9:28 p.m. PT on April 19, 2010 to correct the pricing for ProOnGo subscriptions.